There have been a number of sightings over the last few weeks of an animal, purportedly a black leopard, in Surrey. One of the most recent took place on the 23rd September 2013 and involved a motorist driving on the M25 near to the new Cobham services in the vicinity of Wrens Hill Wood. The motorist observed the animal as it was facing the copse. He described it as "black and the size of an Alsatian" and possibly the same animal he saw the previous week as it emerged from the same copse and headed across a field running alongside the motorway. Both sightings took place in the morning as the witness was driving to work. 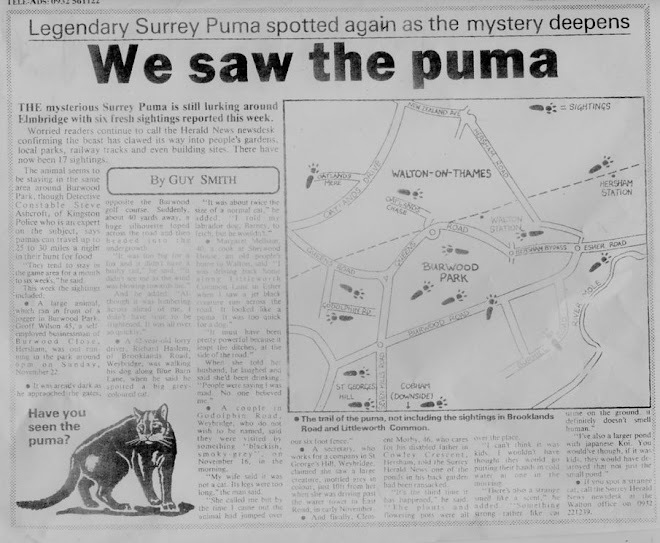 Have you seen the Surrey 'puma' ? Beasts of London - strange animals in the capital. The Centre For Fortean Zoology - the world's biggest research unit into mystery animals. Writer of folklore, cryptozoology, music and film.